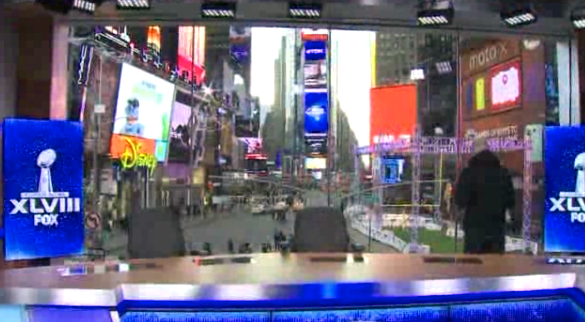 As NewscastStudio previously reported, Fox Sports has erected a three story studio in Times Square for its Super Bowl coverage. The set was designed by JHD Group. Well, after 10 days of construction, the studio is almost ready to go and Fox affiliates are being treated to a tour of it. The structure features multiple windowed venues packed with video panels. 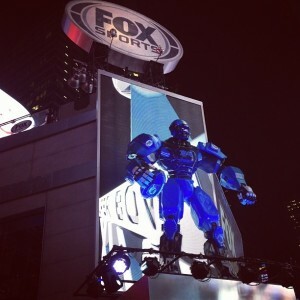 Outside, passersby can take in a large Fox Sports logo, replica of Cleatus the Robot and area covered with artificial grass. Watch the video tour from Seattle Fox affiliate KCPQ-TV.